Concern over climate change and the ongoing challenges of managing degraded ecosystems have made the field of ecological restoration a growing focus in the agendas of national and international conservation organizations, including the United Nations. The problems facing us are both complex and urgent, and effective solutions are needed. Project Planning and Management for Ecological Restoration presents principles of sound planning and management that will greatly increase the likelihood that completed projects will meet stakeholder expectations. John Rieger, John Stanley, and Ray Traynor have been involved in restoration activities for over thirty years and were part of the small group of restorationists who recognized the need for a professional organization and in 1987 founded the Society for Ecological Restoration. This book comes out of their experiences practicing restoration, conducting research, and developing and refining new techniques and methods. In the book, the authors describe a process for planning and managing an ecological restoration project using a simple, four-faceted approach: planning, design, implementation, and aftercare. Throughout, the authors show how to incorporate principles of landscape ecology, hydrology, soil science, wildlife biology, genetics, and other scientific disciplines into project design and implementation. Illustrations, checklists, and tables are included to help practitioners recognize and avoid potential problems that may arise. Project Planning and Management for Ecological Restoration provides a straightforward framework for developing and carrying out an ecological restoration project that has the highest potential for success. Professional and volunteer practitioners, land managers, and property owners can apply these guidelines to the wide variety of conditions and locations where restoration is needed. Long overdue, this book will inform and advance the effective practice of this rapidly expanding field. "Adding to an already rich series on ecological restoration texts, Island Press delivers this book chock-filled with over 100 years of accumulated knowledge and on-the-ground experiences by three luminaries in the field of ecological restoration. With a focus on project management Rieger, Stanley, and Traynor effectively bring the philosophical, ecological, and social aspects of ecological restoration to a practical reality. Students, practitioners, and, yes, even philosophers stand to benefit from reading this book." "I have seen many well-meaning restoration projects fail due to poor planning, but that need never happen again. The authors lend over a century of combined experience in ecological restoration design at a variety of scales to describe the detailed analysis and planning process necessary for successful project design, implementation, maintenance, and evaluation." 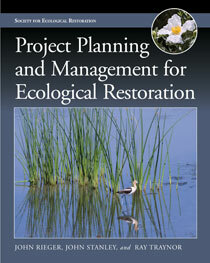 "This sorely needed book presents a comprehensive view of restoration project management from a biological perspective. It will be especially useful to those now entering the field of ecological restoration as practitioners. I wish I had this book when I began my career as a practicing restorationist." "Whether you are a restoration practitioner, student or researcher, this is a necessary handbook of guidelines for all aspects of restoration and management. Nonspecialists and ecologists alike can readily take in the complexities of planning, risk management, and goal setting for regenerating ecosystems. Case studies and flow diagrams are presented to bring the world of planning to life." "This is an excellent text for anyone interested in ecological restoration."